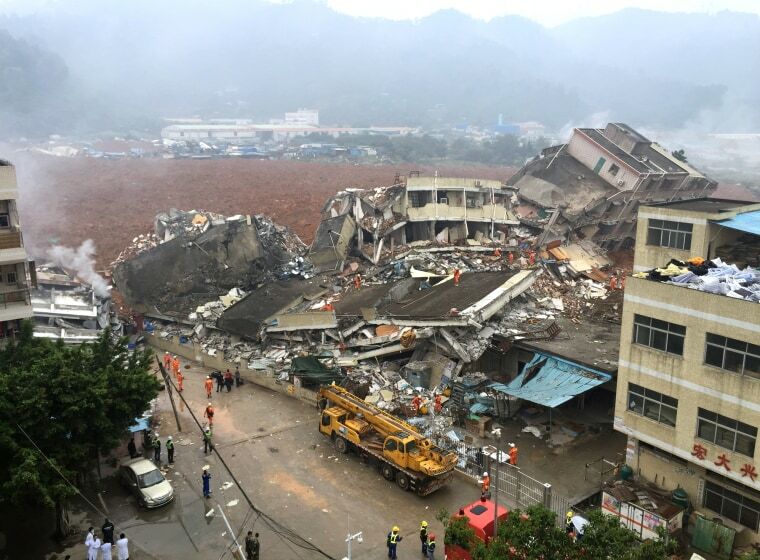 A landslide buried 33 buildings in the Hengtaiyu Industrial Park in Shenzhen, China on Sunday, Dec. 20, 2015. 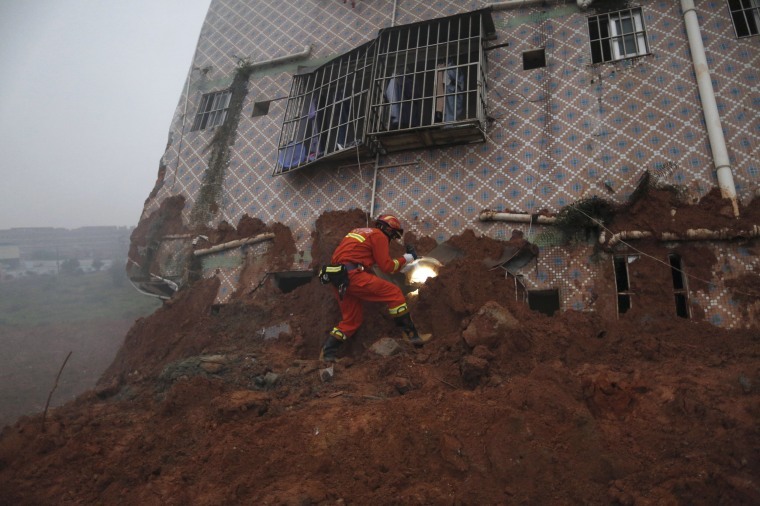 A massive landslide buried 33 buildings in Shenzhen, Guangdong Province, China on Dec. 20, 2015. Three people were injured and authorities raised the number of people missing to 91 on Monday. A destroyed building stands in the mud on Dec. 20. 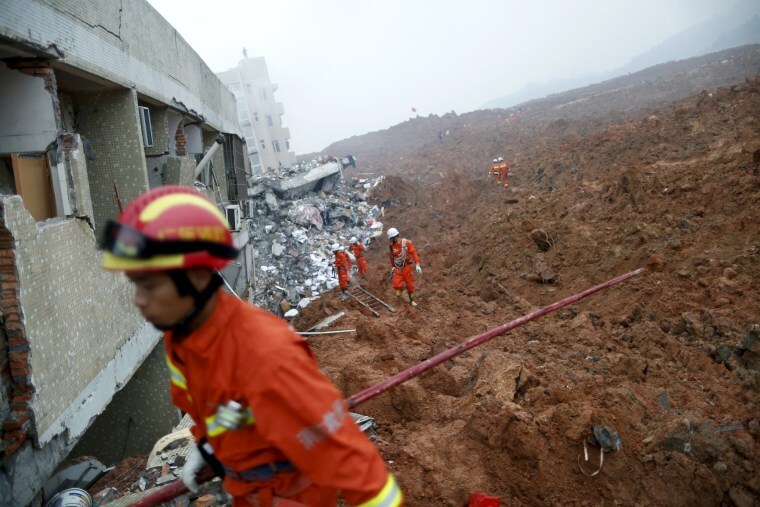 Rescuers approach a collapsed building in their search for survivors on Dec. 20. Firefighters look on as smoke rises in front of a damaged building at the site of the landslide on Sunday, Dec. 20. 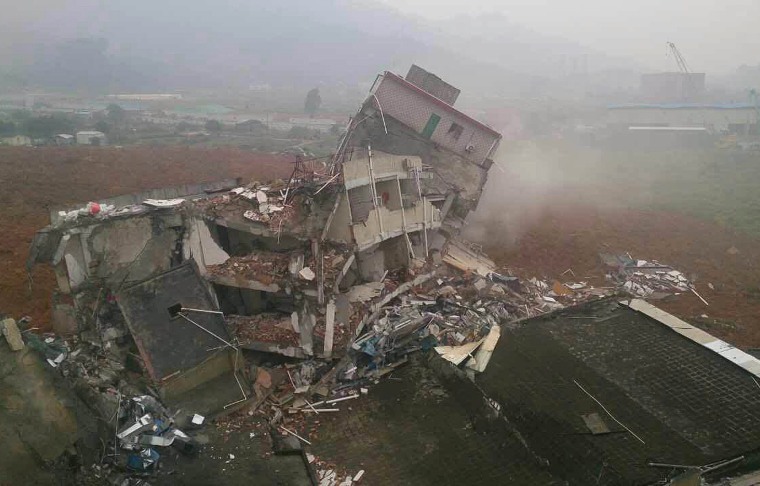 China’s state broadcaster China Central Television (CCTV), said that the buildings buried included at least two workers' dormitories. 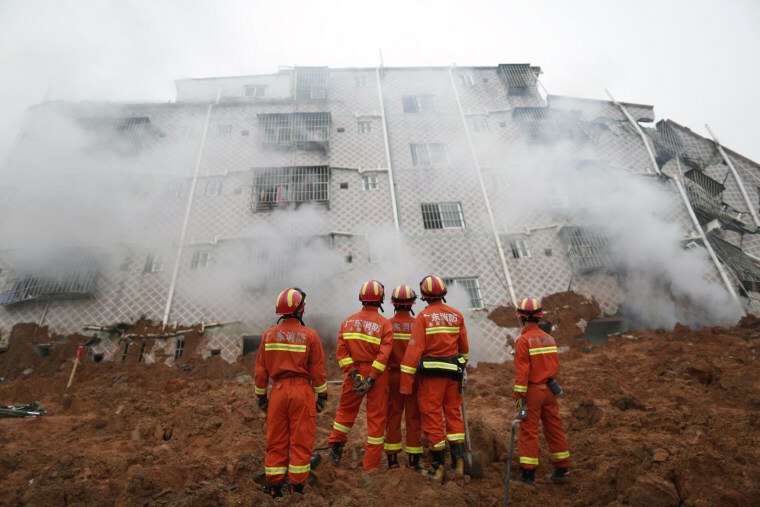 Firefighters search for survivors near a damaged building on Dec. 20. 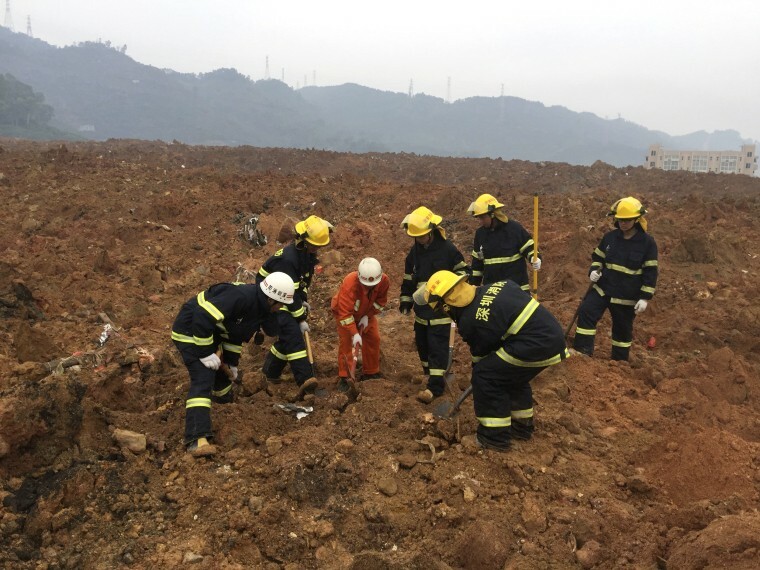 Rescuers search for survivors at the site of the landslide on Dec. 20. 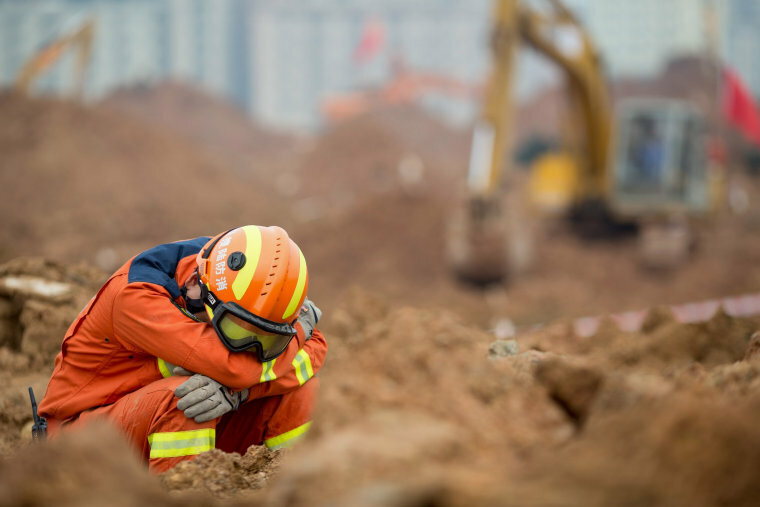 The Beijing Youth Daily, citing a local resident, reported that the soil that slid down onto the area had been piled up against a 110-yard-high hill after being dug up in the past two years. A pair of shoes and other belongings are left near a damaged building as rescuers search for survivors on Dec. 20. 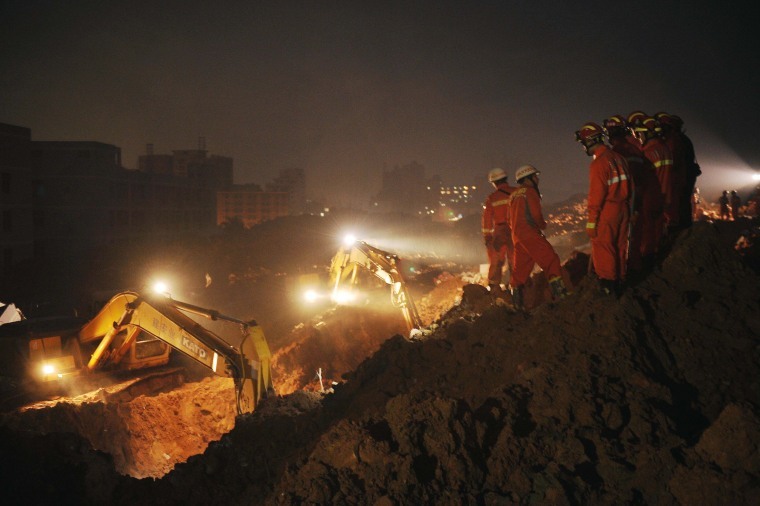 A firefighter uses a flashlight to search for the survivors at the landslide site on Dec. 20. 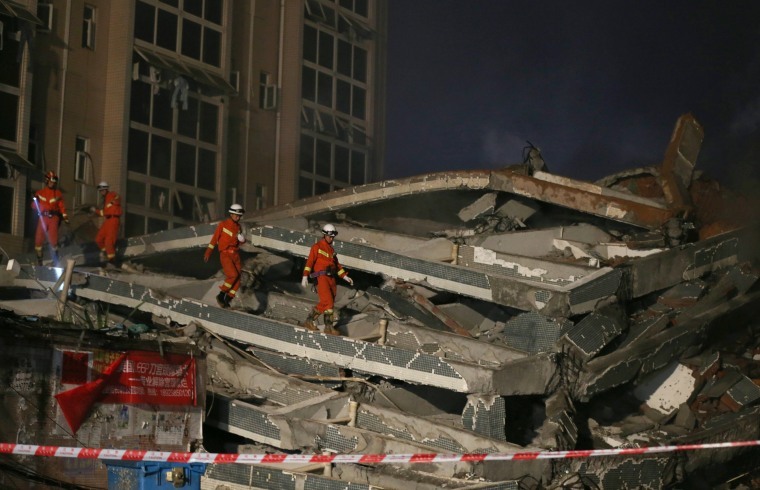 Li Yikang, the deputy secretary general of the Shenzhen city government, said that nearly 1,500 people were involved in rescue efforts. 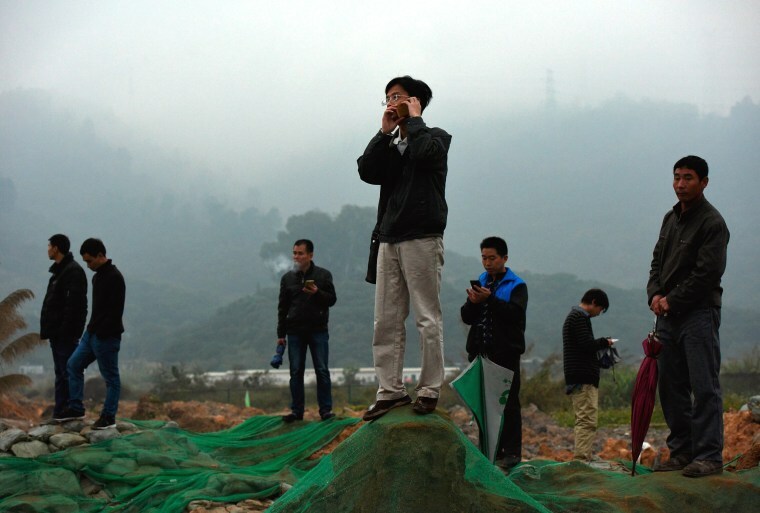 People observe the damage caused by the landslide on Dec. 20. 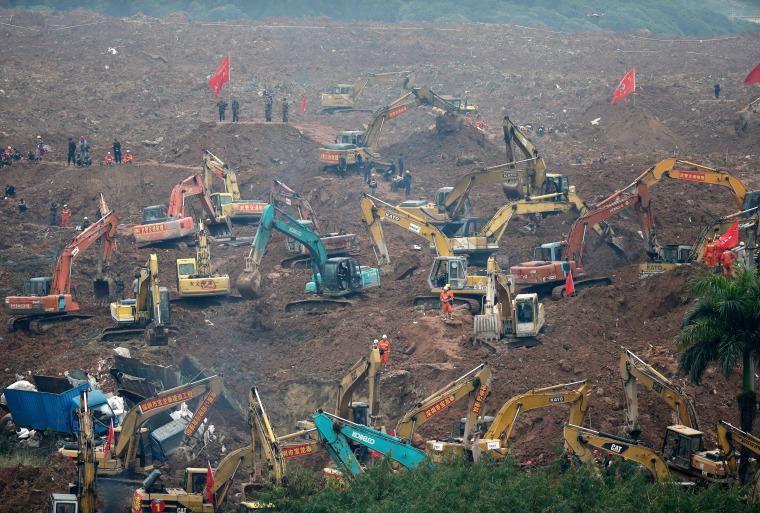 Excavators are deployed as firefighters and rescuers looking for survivors on Dec. 20. 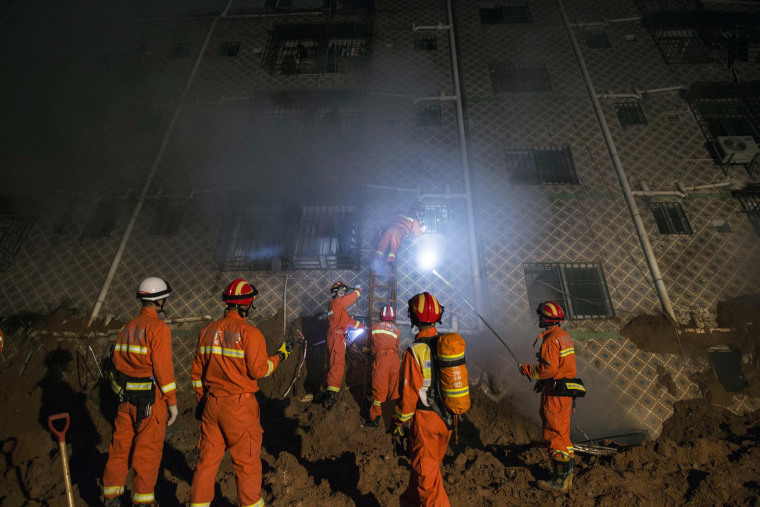 Rescuers look through a window in a collapsed building to search for possible survivors at night on Dec. 20. 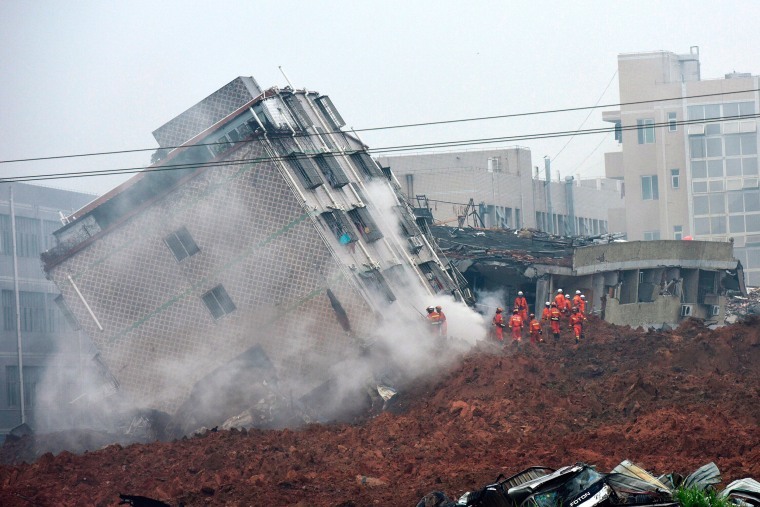 Rescuers work on the collapsed factory buildings brought down by the midday landslide on Dec. 20. 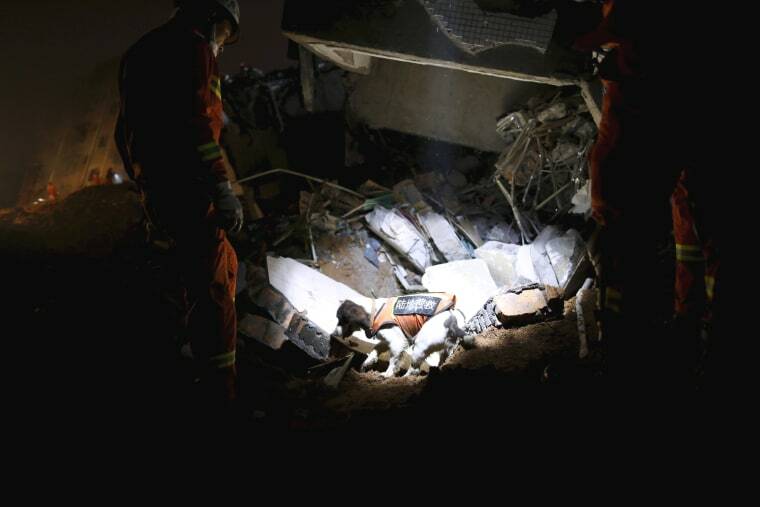 Firefighters with a sniffer dog search for survivors on the site. 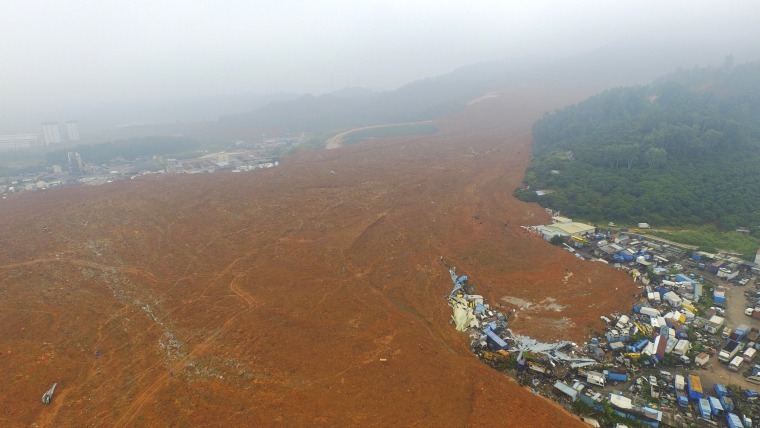 An aerial view shows the site of the landslide which hit an industrial park in Shenzhen, China, Dec. 21. 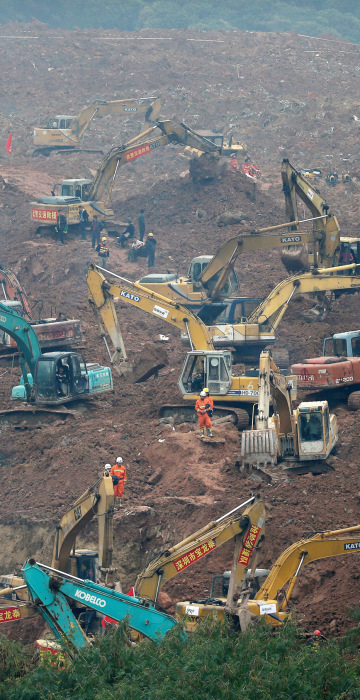 Rescuers use machinery to search for potential survivors on the landslide site on Dec. 21. 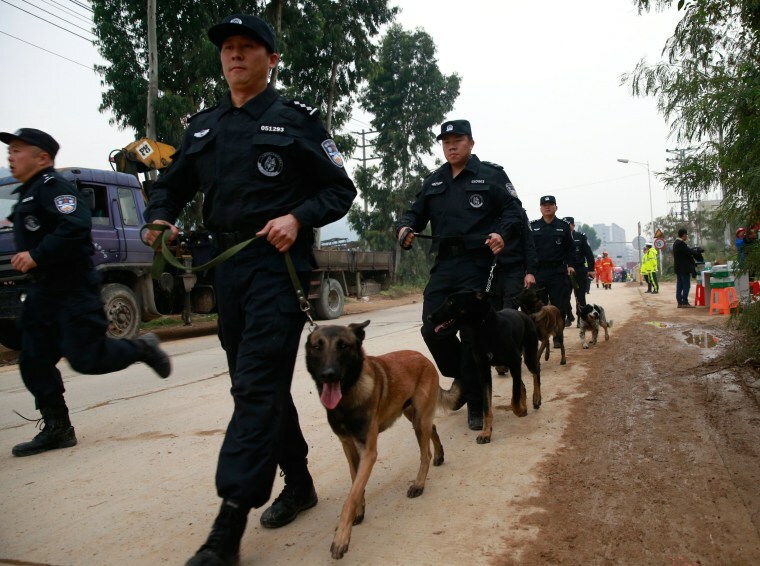 Chinese police officers with police dogs join the rescue efforts on Dec. 21. 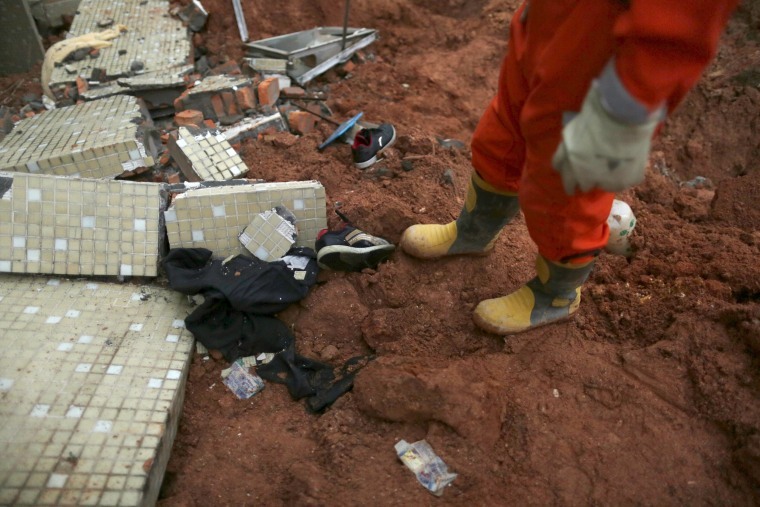 An exhausted rescuers takes a rest as he sits among mud and rubble. Nearly 3,000 thousand people are involved in the rescue, according to media reports. 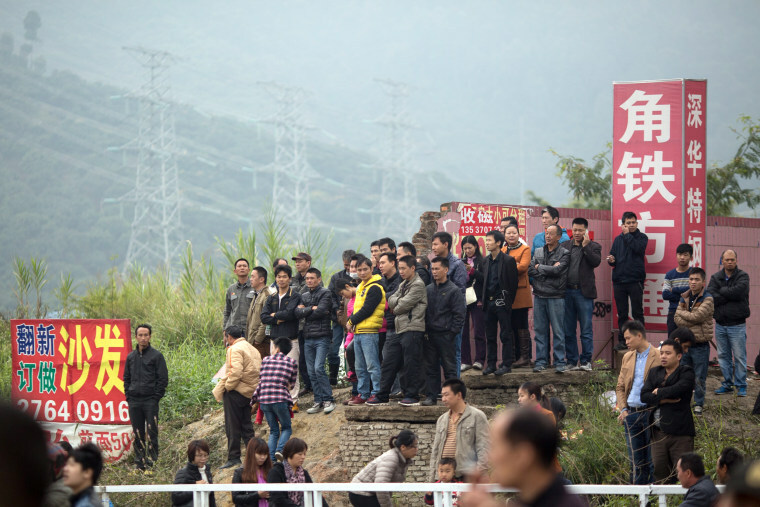 Local residents look on as the rescuing efforts continue on Dec. 21. "Heavy rains and a collapse of a mountain are natural disasters, but this wasn't a natural disaster, this was man-made," a local resident whose surname is Yi told The Associated Press.